Piaggio, the Italian company that makes Vespa scooters and Moto Guzzi motorcycles, revealed its newest development this week: a personal delivery device or “cargo robot,” called the Gita. The robot was designed by a new “startup” within the broader Piaggio group of brands, called Piaggio Fast Forward, in Boston. Gita looks like a carbon fiber take on the exercise ball with tires in a meridian position, and multiple cameras embedded within its shell. It can follow a person, or roll autonomously in an environment it has already mapped. At 26 inches tall, the Gita can carry up to 40 pounds at a time and has a maximum speed of 22 miles per hour, so it can keep up with a person on foot or riding a bike. It can run for about 8 hours of continuous use, the company said. TechCrunch spoke with Piaggio Fast Forward’s Chief Creative Officer Greg Lynn about the inspiration behind the curious cargo bot. He said, “We come from a world of lightweight, two and three-wheeled cycles, scooters and mini trucks. Everything we do is lightweight and made for highly congested cities, like Bangkok or Hanoi, where traffic is a real problem. We wanted to extend people’s movement and encourage them to move more freely and easily, even in congested environments.” He noted the Gita has a zero turning radius. Piaggio Fast Forward has taken a different approach to circumventing traffic on the ground than other startups in this space, such as the delivery drone makers Flirtey and Zipline or Starship Technologies, which makes semi-autonomous personal delivery robots. The Gita has to follow a human around to learn how to navigate around a new environment. Its design allows it to go wherever a person in a wheelchair could go, including ADA-compliant ramps, elevators and grocery store aisles. 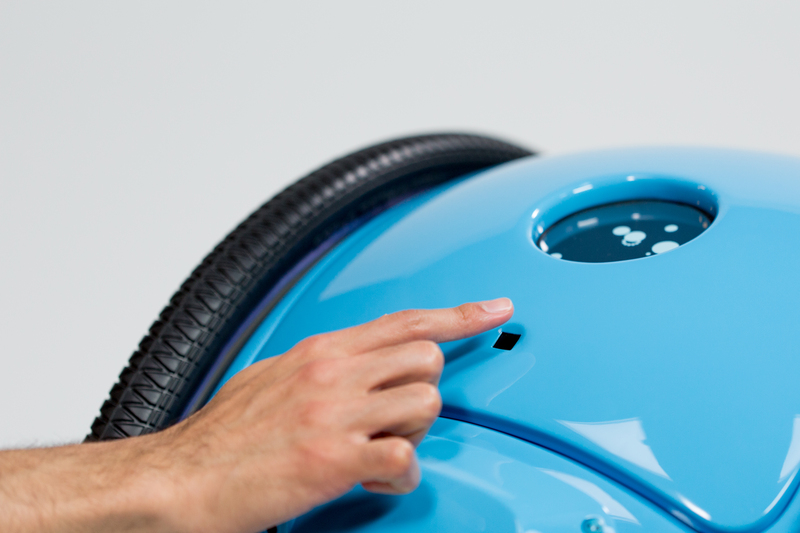 The biometric lock on the Gita, a cargo-carrying robot from Piaggio Fast Forward. Hoffman also said running Gita units indoors and out with select partners will help the company amass a database of location data that’s not available through resources like Google Maps today. It could lead to better navigation tools to help people get around sprawling structures like airports, campus buildings, parking lots and resorts. These are also places where the Gita could ostensibly alleviate workers and visitors from carrying a heavy load, whether that’s suitcases or tools. In the next six months, Piaggio Fast Forward plans to run pilot tests with Gita on different college campuses and in towns in the U.S. The company is not thinking about delivering burritos or groceries, so much. It envisions the Gita assisting maintenance, gardening and custodial workers, and others who must cart heavy things around to get their jobs done on a given day, especially at resorts, senior living and school campuses.